Agreeing And Disagreeing With Roger Ebert On Dim Projection | Birth.Movies.Death. Tim weighs in on the controversy about dim 2D projection. There has been a great deal of chatter this week about Sony 4K projectors, dim bulbs and “lazy” projection. I like the dialogue that it is sparking and I wanted to weigh in on the matter, particularly since Alamo Drafthouse Lamar and Village have standardized on the Sony 4K projectors in question. The debate reminds me of a time back in the analog days when it became known that some theaters were swapping out expensive and fast-burning jumbo bulbs for smaller, dimmer bulbs in some of their big houses to save money. See that article here. We stayed ahead of the curve then, and we are trying to do so now. A few days ago this article on the Boston Globe blog came out about dim 2D digital projection. Then Ebert piled on with his blog post, The Dying of the Light. Their general concern is correct. A theater should NEVER be underlit. There are industry standards for acceptable light levels for both 3D and 2D presentations. Cinemas should always operate within this range. Alamo owns a light meter and we check light levels on all of our screens monthly at a minimum, sometimes as much as weekly. It is a very easy tool to operate, all cinemas should own one, despite the reasonably high price. At the Alamo, light levels are manually boosted for 3D screenings. Increasing amperage to boost the light level on the Sony projectors is a relatively easy adjustment. The bulb needs to be burning hotter to produce a brighter 3D image. When the image leaves the lens of the projector, it passes through a polarizing filter in front of the lens. You are also wearing what are ostensibly sunglasses in the theater, so in order for an image to be appropriately bright after passing through the filters and your glasses, the intensity of the light needs to be much higher for 3D films. Alamo projectionists make this adjustment for every 3D show. There is no debate on this topic; Sony is the clear and undisputed champion of 3D presentation. Sony upgraded the technology in their digital projectors to introduce a new dual lens system for 3D. All other digital projectors use a single lens system that alternates between the image for the right eye and the left eye very rapidly. This can cause a perceived flicker. Sony projects two continuous images one in each of the lenses (both Ebert and the Boston Globe got this wrong in their articles, btw). When the lamphouse is adjusted correctly, Sony delivers the brightest, crispest, best 3D image in the industry. That is the reason why we went with Sony in the first place. Sony was the first to introduce a 4K digital projector. The industry standardized on a 2K image and that is the technology that has been rolled out in most cinemas. I personally flew to LA to do a side-by-side comparison of 2K vs. 4K and the decision was clear. We went with the Sony 4k projectors. In the last few months, other brands are now coming online with their 4k projectors, but it was Sony that led the charge and their product remains exceptional. It is VERY difficult to swap out a 3D and a 2D lens. I HATE this design and so does every other Sony theater operator, I am sure. It is a known issue and Sony has told us that they are working on a solution. Perhaps with all the hubbub this week, that solution will come sooner rather than later. It takes about 1.5 hours or more to swap lenses and do the necessary calibration. Currently there are only two people at the Alamo that are technically capable of doing it and it is far too risky to attempt this between shows when the clock is ticking. If we know we are showing 2D ONLY on a given screen, Alamo projectionists will swap out the 3D dual lens for the 2D lens. We are one of the only theaters in the country that routinely does this swap. If we are running a complex schedule with 2D and 3D on the same screen on the same day, however, we DO leave in the dual 3D lens for the 2D presentations. However, we DO remove the polarizing filters from in front of the lenses for 2D screenings. The polarizing filters are what drastically reduce the light. You can have great 2D presentation with the 3D Sony lens PROVIDED YOU REMOVE THE POLARIZING FILTERS. The problem of low light levels referenced in the articles above point to the 3D lens as being the culprit. That is not the case. The problem is the filters and you can rest assured that these are removed any time we are showing a 2D film with a 3D lens. I am a stickler for presentation and want to make sure that every screening at the Alamo lives up to my high standards. Bulbs are expensive, and it is very tempting to run bulbs well past recommended bulb life or to not run them as hot as you can in order to extend their life. From January to April, we spent $23,000 on bulbs for Lamar alone. We will not skimp on bulb size or bulb life at the Alamo. Regardless of what technology you have: film or digital, Sony or Christie or Barco, there are very basic inspections and routine maintenance procedures that need to be done to ensure proper presentation. We do all of these at the Alamo Drafthouse in Austin. 1) Have a light meter and train your projectionists how to use it. Run monthly light level reports on all screens. 3) If you are using the Sony 4k digital projectors, train your staff on how to remove polarizing filters and always remove them from 2D screenings. 4) This is not light related, but we run a regular inspection on all discrete audio channels. We like the sound in the cinema loud and sometimes that blows speakers. Routine inspections can identify blown speakers. You may look back at the projection port glass window at the Alamo during a 2D screening and see two lights coming out of the booth. This DOES NOT mean that we are running below spec light levels or somehow being lazy about our projection. We will let the picture on screen speak for itself. That said, if anyone ever has a bad presentation experience at the Alamo, I want to know about it. Send me a note on Facebook or send me an email to [email protected]. One-time mistakes can always happen, but I will always continue to strive for the best possible presentation, and right now I believe that to be with the Sony 4K projection system. 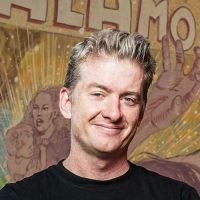 Tim is the founder of Alamo Drafthouse Cinema, co-founder of Fantastic Fest and was named by the Austin American Statesman as "one of the most unusual CEOs in Texas history." He likes to eat really good food, drink really good beer and sing really bad karaoke but is getting slightly better at it.